2011 saw a complete top-to-bottom overhaul of the Infiniti M35, morphing it into the M37. It is not surprising, then, that 2012 sees little new in Infiniti’s entry-level trim for the luxury sport sedan M series. A newly available 18-inch wheel package comes with triple-split, 5-spoke aluminum alloy wheels, and a new, graphite-color interior is available for vehicles outfitted with the available Deluxe Touring Package. Little change may be a good thing for the M37, which drives a 3.7-liter VVEL DOHC V6 engine making 330 hp at 7,000 rpm and 270 lb-ft at 5,200 rpm. Fuel economy estimates for the M37 aren’t stunning (18 mpg city/26 highway), one of the few downsides for the car (buyers may want to eyeball the new-for-2012 M35h hybrid for better fuel economy and power). But since the M37’s handling has been described as nimble, light and responsive (and better, many think, than the heavier high-end M56), the 2012 M37 should continue to please drivers for both power and responsiveness. Like the other cars in the M series, the M37 comes with a standard 7-speed automatic transmission with Adaptive Shift Control and a manual shift mode. The Drive Mode Control allows drivers to select from Standard, Eco, Sport and Snow modes, adjusting the throttle and transmission shifts accordingly to maximize performance and efficiency. Although rear-wheel drive is standard, an intelligent all-wheel-drive version is available (dubbed the M37x), although it has slightly lower fuel economy numbers (17/24). The 2011 M37 focused on luxury and performance, designed to take on European rivals in the field, and the 2012 model seems set to continue along this same path, both with standard features and available packages. Outside, the M37 will offer standard high intensity discharge xenon headlights with an adaptive front lighting system available in the Technology Package. Front foglights and LED rear brake lights are also standard. Other notable exterior features include a power tilting and sliding moonroof and power-folding and heated outside mirrors. The 2011 interior was lauded for its spaciousness, luxury, high-quality materials and user-friendly design and technology. 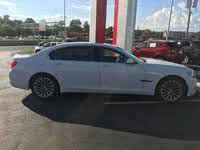 2012 M37s should offer nothing less. Seating for 5 is covered with standard leather and heated in the front seats, which can be adjusted 10 ways. The Intelligent Key provides access to the car without even removing it from your pocket and allows the car to start using a push-button ignition. Individual keys can also retain memory settings for the mirrors, two drivers’ preferred seat positions, and the power tilt-and-telescoping steering wheel settings, as well as recalling the last-used settings for climate, audio and navigation. The front armrest has a two-level storage compartment and provides a 12-volt power outlet, auxiliary jacks and a USB port. The luxury continues with standard Japanese Ash wood trim and a 6-speaker audio system providing AM/FM/CD with MP3 playback capability, Radio Data System (RDS) and speed-sensitive volume. XM satellite radio is included but requires a separate subscription. The audio system can be operated via steering-wheel-mounted controls or by the Infiniti Controller, which can also operate a standard Bluetooth hands-free phone, the climate control system and optional navigation system. It is noteworthy, however, that although numerous functions in the car can be controlled by the single Infiniti Controller knob, they can also still be controlled via the individual buttons associated with the system or via steering-wheel controls. In 2011, this design earned much notice, since competitors (such as BMW’s iDrive or Mercedes’ COMAND) subsume individual controls under one knob, necessitating a steeper learning curve and layers of menus. The M37 also continues to provide standard HomeLink universal remote and cruise control, as well. A number of options packages continue to be available for the M37, adding even more technology, safety features and luxury touches. The Premium Package adds, among other features, a hard drive navigation system, voice recognition, XM NavTraffic and NavWeather as well as a Zagat restaurant guide. The audio system is upgraded to a Bose 10-speaker premium audio system and includes a 9.3GB Music Box hard drive for storage. The Deluxe Touring Package upgrades the interior materials with White Ash silver-powdered wood trim and semi-aniline leather seats. The Bose audio is upgraded further with the Studio Surround system with 5.1-channel decoding and 16 speakers. The Forest Air system is added, which, according to Infiniti, “attempts to recreate the refreshing climate and natural breezes of a relaxing forest setting.” Last year, some found the system gimmicky, while others appreciated the humidity control, Plasmacluster air purifier and the Breeze mode, which varies the airflow from the upper and front air vents to create the feeling of a natural breeze. The Sport Package equips the M37 with larger (20-inch) performance tires, a sport-designed front fascia and grille and a 4-wheel active steering system (requiring less steering work at lower to medium speeds and providing a more even feeling at higher speeds). Paddle shifters are added for the 7-speed transmission as well as larger sport brakes and a sport-tuned suspension. The Sport Package can be upgraded to the Sport Touring Package, adding the Bose Studio Surround and Forest Air systems, as well as a rear power sunshade. 2011 reviews found aspects of the Sport package to be a mixed blessing, however, with the sport suspension and larger wheels reducing the quality of the ride and increasing the amount of road noise. The Technology Package adds to the lineup of safety features with a blind-spot warning and intervention system, intelligent cruise control, lane departure warning and prevention, intelligent brake assist with forward collision warning and an adaptive front lighting system to direct headlights toward the corner when turning. This is not to suggest that the M37 skimps on standard safety equipment, with advanced airbags in the front (including an occupant detection system), standard driver and front-passenger side-impact supplemental airbags and roof-mounted curtain side-impact supplemental airbags for the front and rear. In the event of a crash, the hazard lights are automatically turned on when the airbags are deployed. Antilock brakes with electronic brakeforce distribution and brake assist are included in the safety list, as are vehicle dynamic control and traction control. 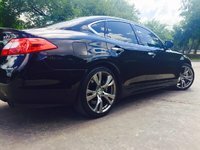 The 2011 Infiniti M37 scored well with the new National Highway Transportation Safety Administration standards, for both the rear-wheel- and all-wheel-drive versions, with an overall 4 out of a possible 5 stars. Front and rollover crash tests also earned 4 out of 5 stars, while the side crash test merited a perfect score. The Insurance Institute for Highway Safety picked the M37 as a Top Safety Pick for 2011, with its highest rating of Good in all crash test categories. It should be expected that the 2012 M37 will continue to win high marks in safety. What's your take on the 2012 INFINITI M37? Users ranked 2012 INFINITI M37 against other cars which they drove/owned. Each ranking was based on 9 categories. Here is the summary of top rankings. 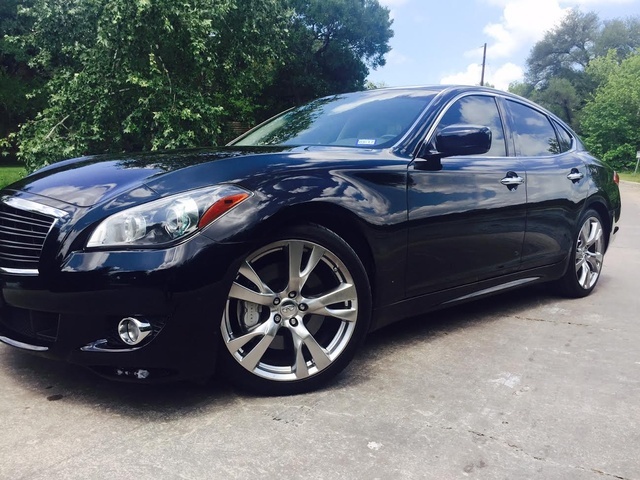 Have you driven a 2012 INFINITI M37?